Posted August 9th, 2011 by Meg & filed under beekeeping. The time has arrived! The first meeting of the NYC chapter of the Backwards Beekeepers is here! 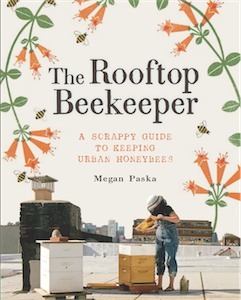 Brooklyn Grange will be hosting on their vast rooftop farm, Sam Comfort will be there waxing philosophical about treatment-free beekeeping…growing strong bees, resisting the urge to rely on chemical crutches to keep your bees alve, catching wild bees, swarming, all of the things that make a beekeeper “backwards”. We hope that many of you can make it. We encourage folks to bring a small jar of the honey they harvested this season so that we can all . We’ll have some fresh baked bread from Roberta’s on hand to serve along side of it while we marvel at the genius of bees and the hazy Manhattan skyline. While you are at it, we hope you will “like” our Facebook fan page too! We’ll post updates frequently and share pictures of our beekeeping adventures as well as dates for upcoming classes and workshops led by some of our members, like Tim O’Neal, Sam and myself! Hope to see many of you urban beeks there! p.s. Big, big, BIG UPS to Renee Garner for designing our logo. It’s freaking awesome and we’re so lucky to have such talented people willing to help us out! You’re amazing, Renee!